"Peter, Peter, Caviar Eater" is the first episode of the second season of Family Guy, a holdover from season 1, originally aired on Fox on September 23, 1999. It guest-stars Robin Leach as himself, and Fairuza Balk as Coco. This episode's title is a reference to the nursery rhyme Peter Peter Pumpkin Eater. Lois' wealthy aunt Marguerite Pewterschmidt comes to visit, but drops dead the second she arrives. A videotaped message from Aunt Marguerite informs Lois that she has inherited Cherrywood Manor in Newport, Rhode Island. At their arrival, the Griffins receive a warm musical welcome from the house's staff, who immediately leave afterward because Marguerite only paid them up to the song. Peter hires them back after admitting that he secretly sold the Griffins' former house in Quahog. Peter has trouble fitting in with the blueblood cluster after disgusting everyone with a story about a rat at the yacht club, while Stewie adapts immediately to ordering servants around, even commanding two to fight to the death for his amusement. Peter begs Brian to teach him how to be a gentleman. After several attempts through regular methods, Brian resorts to shock therapy. That night, Peter arrives at a very ritzy charitable auction in a new persona, "Lord Peter Lowenbrau Griffin the First" ("Lord Griffin"). Lois is shocked to see him behaving himself and conversing easily with the upper crust crowd. Unfortunately, he also appears to believe himself fabulously wealthy, as he nonchalantly bids $100,000,000 for a 17th-century vase. Lois demands that the family return to Quahog as soon as possible; she says that she now remembered why she left Newport: because it changed people in much the same way that her family is changing. Brian is only able to snap Peter out of his delusion by comparing him to Lando Calrissian and smashing one of his Star Wars collector's glasses. Brian explains to Peter he is not really a millionaire. Although Peter returns to reality, he is still $100,000,000 short on covering his auction bid when Mr. Brandywine from the Historical Society comes to collect. When Peter is trying to prove that millions of dollars of history happened in the mansion, he points to a note on the wall dated 51BC that states "Jesus was here", a large crack in the wall (which he pretends is where the Stock market crashed), a small toy train under the floor boards (which he pretends is part of Harriet Tubman's Underground Railroad), and a stone saying when the Pilgrims had visited Fraggle Rock. Mr. Brandywine sees through Peter's scams, however, and demands that he come up with the money by the morning. Lois tells Peter she is leaving him, only for Peter to say that the Lord Griffin persona is dead and only Peter the towel boy is there. He bemoans how everyone was right about him not being good enough for Lois, but she explains she doesn't care what everyone else thinks. Just then, Peter finds a set of hidden photographs of several prominent American figures (including Abraham Lincoln, Robert E. Lee, and Ulysses S. Grant) at Cherrywood Manor, which was a whorehouse at the time. Not only does the discovery make Cherrywood enormously valuable, but Peter sells one of the pictures to the tabloids to buy back his old house for double what he sold it for. At the end of the episode, Peter no longer cares what Lois' family thinks of him, since her ancestors were nothing more than "a bunch of pimps and whores" and does his signature laugh. This marked the first appearance of Carter Pewterschmidt who is voiced by Seth MacFarlane. Peter, Peter, Caviar Eater is the first episode of the second season of Family Guy. It was directed by Jeff Myers, while Peter Shin and Roy Allen Smith acted as supervising directors. It was written by Chris Sheridan. Mike Henry and Andrew Gormley worked as the staff writers for the episode while Garrett Donovan and Neil Goldman acted as story editors. The episode also had Ricky Blitt as an executive story editor. Ron Jones composed the song used in the episode, while his brother Stan helping in the editing of said song. 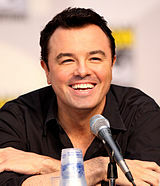 The episode introduced the characters, Carter Pewterschmidt, Lois's father, voiced by show creator Seth MacFarlane and Barbara Pewterschmidt, Lois's mother, voiced by Alex Borstein. Both characters would become recurring characters of the series appearing in future episodes including "Welcome Back, Carter". In addition to the regular cast, voice actor Kevin Michael Richardson, actress Fairuza Balk and actor Gregory Jbara guest started in the episode. Other voices included Alex Thomas, Robin Leach and Bill Escudier. Recurring guest voice Lori Alan voiced Dianne Simmons. The videotaped will of Aunt Marguerite begins with an introduction of Newport mansions parodying the VH1 TV series Fabulous Life Of narrated by Christopher Flockton. Peter is shown watching the sitcom Frasier and Ricki Lake. When Stewie walks down the hallway, he sees the two little girls from The Shining. At an auction, Peter buys an antique vase for "100 million dollars" while making a characteristic "Dr. Evil" gesture from the Austin Powers films. Stewie makes two servants fight each other, during which the theme from Star Trek's "Amok Time" episode can be heard. Brian uses story elements from The Empire Strikes Back to describe Peter's current situation. When Peter needs money to pay for the vase, he remembers how he "should have kept Mean Joe's jersey", a reference to the famous 1979 "Hey Kid, Catch!" television commercial, in which a boy gives Mean Joe Greene a Coke, and Greene gives the boy his jersey. (This version has Mean Joe giving all his clothes to Peter, and Peter, scared, runs off without his jersey.) The elaborate song sequence, "This House is Freakin' Sweet", spoofs the song "I Think I'm Gonna Like It Here" from the 1977 musical Annie. In his 2008 review, Ahsan Haque of IGN praised the episode, rating it a 9.5/10, stating that it was "very memorable" and "highlighted by Peter's idiotic creativity and social ineptitudes, and one of the better musical segments of the series". Series creator Seth MacFarlane described "Peter, Peter, Caviar Eater" as a "fine, fine episode", praising the episode's artistic value and calling Ron Jones' musical score as "beautiful." This episode was nominated for an Emmy Award for Outstanding Music and Lyrics for the song "This House is Freakin' Sweet". ^ a b c d e f "Family Guy - Peter, Peter, Caviar Eater - Cast and crew". Yahoo!. Retrieved June 20, 2011. ^ "Alex Borstein (Lois) Laughs at the Once-Dead Family Guy's Longevity". TV Guide. November 13, 2006. Retrieved August 24, 2009. ^ "Lori Alan:Credits". TV Guide. Retrieved October 27, 2009. ^ a b Haque, Ahsan (8 July 2008). "Family Guy: "Peter, Peter, Caviar Eater" Review". IGN. Retrieved 2009-12-01. ^ MacFarlane, Seth (2003). Commentary for the episode "Peter, Peter, Caviar Eater". Family Guy: Volume 1 (DVD). 20th Century Fox. Callaghan, Steve. “Peter, Peter, Caviar Eater.” Family Guy: The Official Episode Guide Seasons 1–3. New York: HarperCollins, 2005. 44–46.